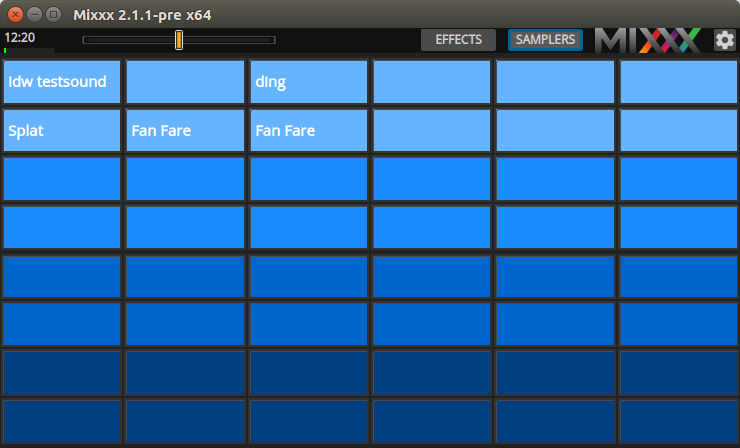 The skin in this example is configured to provide 48 individual samplers because it will be used with a Midi controller that supports that many signals. The Midi controller I am using has 12 physical buttons and can switch between 4 banks. That’s why 12 samplers share the same shade of blue. Those belong to the same bank. In order to fill a sampler with a new sound or to remove a sound from a sampler the rows can be expanded via the skin’s settings. After playing around for a little while I realized that it’s quite hard to find the correct sample when using the dedicated Midi-controller that I built for the intended usecase. Just messing around is fun but trying to trigger that one certain sample via Midi whose name you saw on screen needs some “serious” thinking. The reason is simple but annoying: The Midi-controller uses a 4*3 button-matrix while the skin’s layout incorporates a 2*6 pattern. Both layouts are sensible according to their surroundings so it wouldn’t bring any benefit to change the skin’s layout to a 4*3 matrix – that would simply squeeze the onscreen-buttons to an uncomfortoble dimension. Completely changing the background color of the skin’s buttons would be possible but tedious: a white background surely would need another text color (black, I guess). Furthermore it would make the skin simply look plain ugly and would not really be beneficial for anything else than that certain Midi-controller. That’s why I added an overlay which provides some colorcoding and which can be hidden via the skin’s settings. That’s an okay compromise and I learned a few new tricks about how to implement these things in Mixxx. Besides the technical aspects of creating a skin completely via xml building a userinterface for a minimum-sized touchscreen has its very own challenges. Rotary encoders, for example, are an absolute no-go. This just doesn’t work. That’s why the master gain is realized as a fader in the toolbar on top of the screen. From a technical point of view it’s probably not necessary at all since the outgoing signal will be fed into a dedicated audio-mixer but I wanted to have some control over it – just in case. This is easy: I could have gone for the technical approach and create a well-formed xml-file containing all the necessary settings. But I was lazy and just used the built-in wizard. Configuring every button of the Midi controller was a little bit tedious but it had to be done only once so I guess it’s okay. While working on this skin I discovered a bug that exists in Mixxx Version 2.1.1 and 2.2.0 alpha pre: As soon as you add a 33rd sample to a bus (L / M / R) the playback of every sample on that bus becomes corrupted and unusable. See this video for an explanation. This seems to happen on Raspberry PI, Linux and on a Mac (I didn’t test it on a Windows machine). I already filed a bugreport for this. The issue can temporarily be circumvented by placing the samples on different busses. The bug will probably be fixed in Mixxx Version 2.1.2. If you like the idea of this skin and want to use (or expand) it yourself you can download the latest version of the skin here. 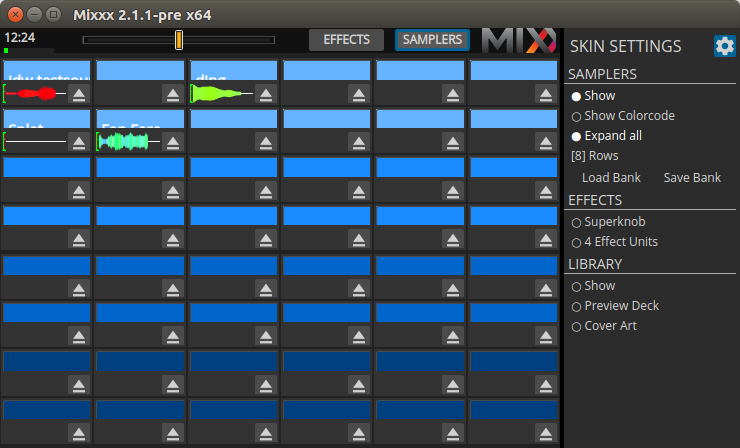 Simply extract the folder into your Mixxx’s skin-folder. 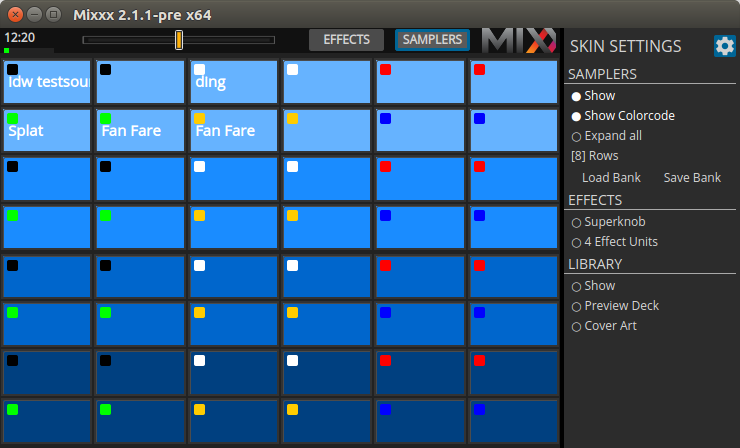 Restart Mixxx and select “Sampler-only (48 cells)”. Feel free to let me know if you have anything to contribute or if things are left unclear. 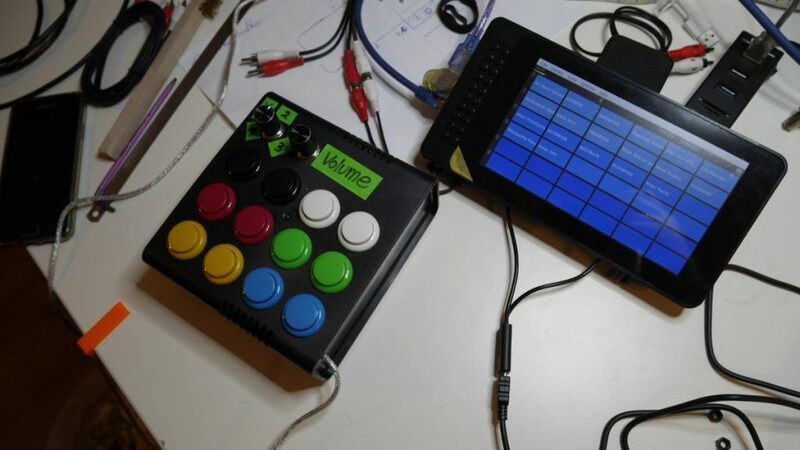 Tagged Mixxx, raspberry pi, sampler, Skin, touchscreen. Bookmark the permalink.